There is an old joke in martial arts circles that “The older a Black Belt gets, the better he used to be”. I have never wanted this to be me, and use a lot of self-effacing humor to keep anyone from putting me into the category of those “masters” who embellish their stories more and more as they promote themselves to higher and higher ranks. I have given a lot of thought to this, and I want to find a clear definition of what rank is, and what it means. I hold various ranks in different systems of martial arts, black belt (or equivalent) in some, under belt in others. I do not study for rank. When I was a beginner, rank was everything. The black belts were special people, and you just knew they had some mystical powers. After I became one I found out that black belts were just ordinary people, with good skills, but skills that anyone who was dedicated enough to keep training could have for themselves. Somewhere along the line things changed in the martial arts. I tend toward the theory that the changes probably began with people wanting to be a black belt more than they wanted to earn a black belt. I still run into people of this sort every day, and it seems to happen a lot more than in the past. With the advent of the McDojo across this country, black belts got a lot easier to have, and people had to go through the time and classes and test to get it, who cares if no one ever fails the tests in these schools, these students can still tell themselves that they earned the rank. Of course with the massive promotion of people to black belt, the McDojo needed to keep their instructors and/or organizational founders up above the rest of the people. 10th Dan was suddenly 15th Dan (google it and you will find some! ), and even 20th Dan! Why? There is one guy not to far from where I live who claims a rank of 15th Dan. Why do we need this sort of nonsense at all? Why can’t Black Belt be just like every other rank? As I thought about this, I kept looking at my own belt. It is a Japanese style karate belt, with gold markings to note my rank in the Hung Gar organization of which I am a member. Silly. I don’t remember what I was thinking when I ordered it. It is embarrassing, but I take refuge in the fact that there are others more silly by far. I am changing over to a plain black belt with no markings of any kind on it. As moment to moment, what I am teaching my students is probably coming from different points of my own experiences, should I change uniforms and belts for each area that the lesson comes from? The belt system itself is a relatively recent invention, contrary to popular opinion. The first black belts were awarded in 1880. Initially, we are told, there were two ranks, white and black. This grew and grew. There is one group (ATA) that has 17 ranks before black belt! I have heard that there are other groups that have as many as 20! This is where the road leads that starts with promoting and promoting, and yet feeling the need to keep their own rank above everyone. I am opting out of the nonsense. 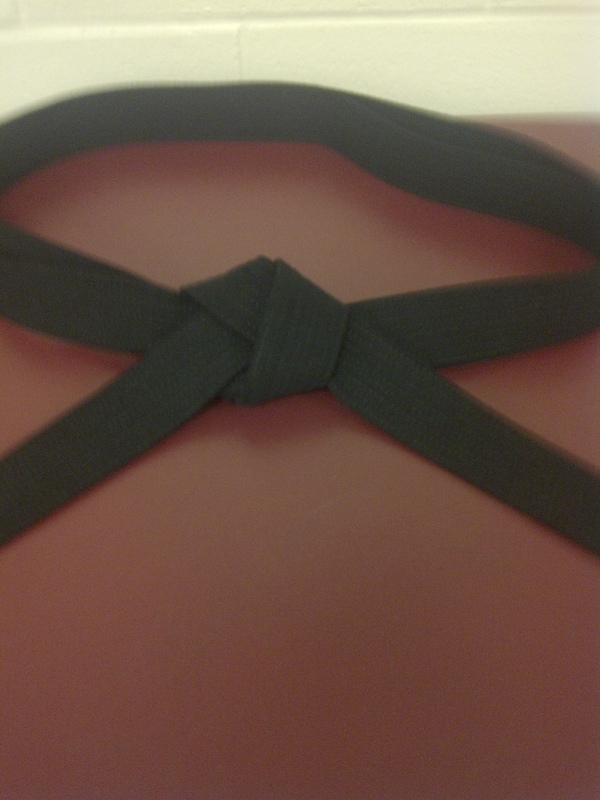 I will wear a plain, non-embroidered black belt when teaching. Why would this be important enough to write about? I try very hard to practice what I preach. In my stand against using lineage as a badge of authenticity, I had to examine what I was teaching and took the approach that I know what I am teaching, and it shows in my product (my students). I don’t need to ride on the reputation of a particular person or family for legitimacy. When I publicly expressed my doubts about the existence of Qi power, I had to withstand the assaults (verbal…but still…) from those in the CMA that hold to this antiquated and asinine lie, as well as go through everything I teach and find ways to test, re-test and prove how it does what it does. I have been saying for years that there needs to be no rank beyond black belt. All that Dan ranking does is give people something else to feed their own ego. They are given a method wherein they are able to tell themselves that they are still better than their students, even when through the decline of skill that comes with age, there are many areas of the art where they are not better than their students. There are some things that I teach that are no longer a part of my skill set. In my late teens and early twenties, I could fly with the best of them, but with a missing LCL and a torn ACL in my left knee, flying kicks are no longer something that interests me. With my wrecked back and crumbly knees, I would prefer to wait for you to come to me than fly to you. There is no ego left for me. When you reach that point where some of what you teach is done through verbal explanations, drawings on the board, and “Billy, show them how to do this kick”, illusions of your own greatness dissolve. There does not need to be any shame in this. I was good. I was very good for a while. I am still pretty good at what I do. There are just some aspects that I had to discontinue training (or get better acquainted with my orthopedic surgeon). If we older black belts can let go of that ego issue that still gets us, if we can cherish but not live in our past accomplishments, and if we can look ahead to where we can go from here, we will be a lot better off, and we will not be mistaken for the guy in the joke at the top of this entry. I am a black belt, and that is enough. Previous Post What can kung fu learn from MMA? lao tsu would be proud…….wait. this way of thinking would be be strong medicine to cure the curseof the ego mind has given us ineqality,poverty,racism. the sage governs by emptying minds and hearts, by weakening ambitions and strengthening bones………..you know who.